As an independent contractor to any company it is important to understand that your email address (or other communications for that matter) reflect your professionalism. You can keep your personal email address, just create a separate business email address. You may want to consider a unique email address that is consistent with your business name or the mortgage field services industry. You should give careful consideration to what comes after the “@” sign in your email address. In your opinion, which email address sounds more business-like? 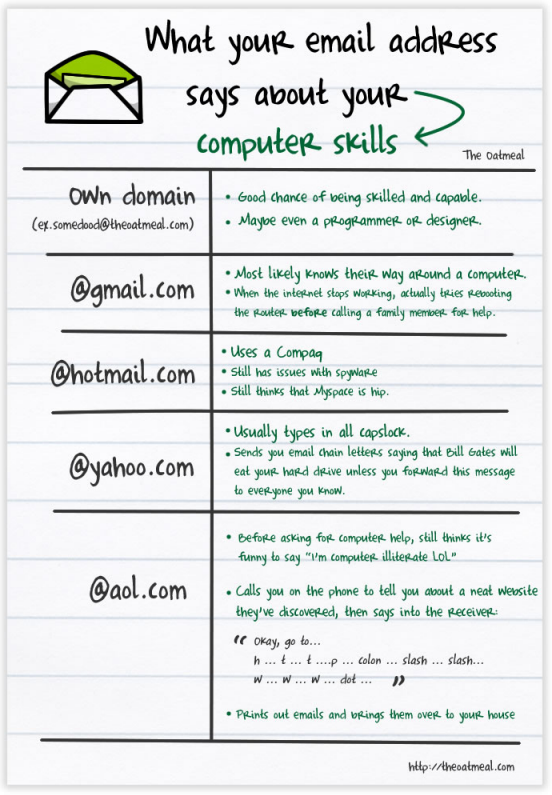 What your email address is, shows a lot about you. And who you host your email address from, says even more. Do not have a business email address with numbers (unless your company name has a number in it such as “A1”. Using your age, street number, graduation date, birth date, anniversary date, etc. implies a more personal email address, not a professional email address. Basically what you are doing is getting yourself a website domain without the website. (Unless of course you want to use and create a website.) What ever you name your website domain is what you use for your email address. They go hand in hand. But just because you have a website domain name does not mean you have to create a website. You can just use the email part for the purpose of having a business email address. When choosing a business name, make sure you think it over carefully. If you don’t already have a business website, you can still obtain a website domain name and not actually create a website. The domain name gives you the ability to create your unique identity. When choosing a business name, make sure you give a great deal of thought for a name that says who you are and what your business does. To find out if the domain name (business name) you would like to use is available, go to NameCheap.com. Don’t use their web-hosting. I can show you a better place. Once you have found the web domain (business name) that you want, you will then have to Register it. Registering your domain with NameCheap.com is fine. This is something you do once a year and is very inexpensive. After registering your domain name you will need to have a place that it is hosted from. I recommend BizzyShark.com because you can have your email (and website if you so desire) hosted there for $1 a month. If you want to make the appearance that you are a legitimate Mortgage Field Service or Property Preservation business, then you have to look like a business. WeDoInspections@aol.com is not a business email address. It’s a fly by night operation that other real businesses are going to shun. Do it right. Get a real business email address.